The PMDX-106 is no longer in production and no stock is available. It is only possible to special order batches of 10 or more. OEMs with special requirements should contact us via email for price and availability quotations. The PMDX-106 is an interface for allowing CNC controller software to manage a machine tool spindle. 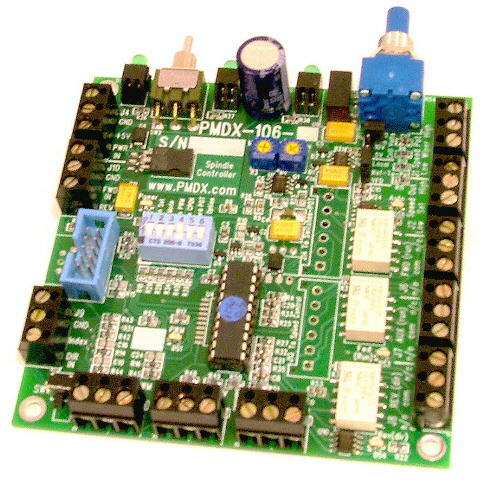 The PMDX-106 does not itself provide or directly switch the motor power, rather it provides an interface between the computer and the Variable Speed Driver or Variable Frequency Driver that powers the motor. Works with any system that can supply Direction and PWM as logic level signals. Operation with a PMDX-120 will require using one axis of step and direction as the Direction and PWM signals because the extra control signals on a PMDX-120 are relay output only. The PMDX-106-OP is intended for mounting directly behind the control panel with the pot shaft, direction switch, and mode LED's protruding through holes in the panel. This type of installation is suitable where the panel is not exposed to harsh environments. The PMDX-106 standard version is designed to have an external pot, switches, and LED's connected by wiring to the screw terminals. This allows ruggedized panel components to be remotely located. The PMDX-106-OP can also be used with remote panel components by setting a dip switch on the board. Download the full manual in PDF format here (revision 0.3, 794 KB).